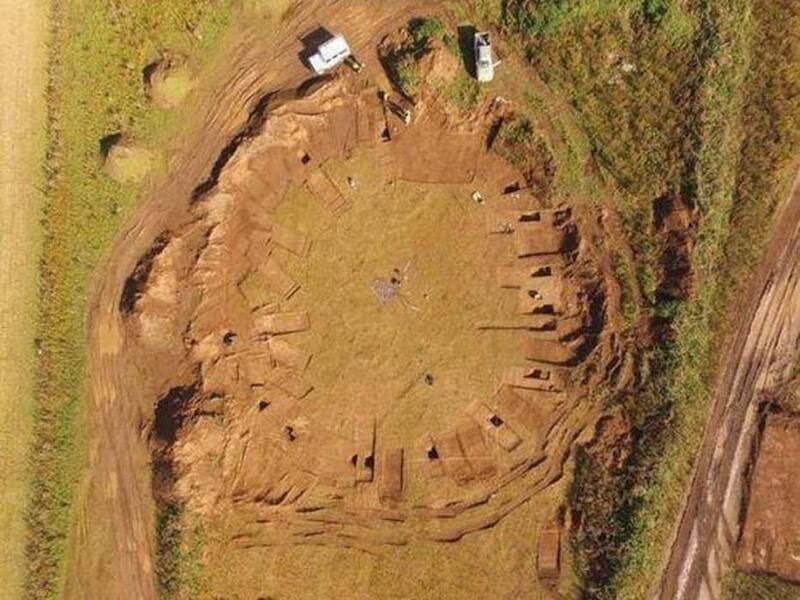 A team of archaeologists from Yorkshire have uncovered a 4,000-year-old “woodhenge,” thus a wooden circle that some now believe might have been used as a sauna. The circular monument – that once stood magnificently on the horizon and was visible from many miles away – was hiding for hundreds of years under farmland before it was recently spotted in aerial surveys. For the past 90 days, however, researchers have been working really hard to discover what they speculated to be East Yorkshire’s first woodhenge (a Stonehenge type structure made from wood instead of stone) at Little Catwick Quarry, near Hornsea, as The Yorkshire Post reports . And they weren’t wrong. Interestingly, the henge's exact location, is Yorkshire's largest privately owned sand and gravel quarry, according to Ancient Pages . England has about fifty recorded henges, including a few other wooden ones. However, the only other henge discovered in East Yorkshire was made of stone. Historians suggest that the once-impressive construction was created at least 4,000-years ago in the late Neolithic to Bronze Age, and it was built out of a series of wooden posts. Later, an encompassing ditch and bank were added with two opposing entrances, one facing North West, the other South East. Curiously, a pit was unearthed in the middle of the henge containing severely burnt stones, while others were discovered to be discarded in the entrances. Mr. Tibbles also told The Yorkshire Post that a cemetery at Sandsfield, just one mile away, featured a similar ditch encircling the site that had contained dozens of urns from the late Neolithic Period to the Early Bronze Age. A link might between the two could reinforce the speculation that the wooden henge was a cremation site. Could it have Been a Sauna? Then again, there are archaeologists who claim that it might have been an ancient sauna. New finds there, have shed new light on the way henges could have possibly been used in Neolithic Britain. According to the supporters of this theory, people were heating up stones on an external fire and then carried them into a building, placing them on an internal hearth. Next, they would sit around it on a ledge, pouring water onto the stones to laze in the steam. “I’d like to totally dismiss it - but they have had them in Finland for 2000 years and there is Marden Henge,” Mr. Tibbles told The Yorkshire Post . Ultimately, Mr. Tibbles also noted that there have been made similar discoveries in Finland and other parts of the UK, including a Bronze Age sauna on the Orkney Islands in Scotland, and the famous Marden Henge, a Neolithic giant about ten times bigger than Stonehenge according to the National Geographic . This monument has now been recorded in detail as it will be erased completely next year due to quarrying. Top image: Aerial photo of woodhenge discovered at Little Catwick Quarry, Yorkshire. (Image: East Riding Archaeology).